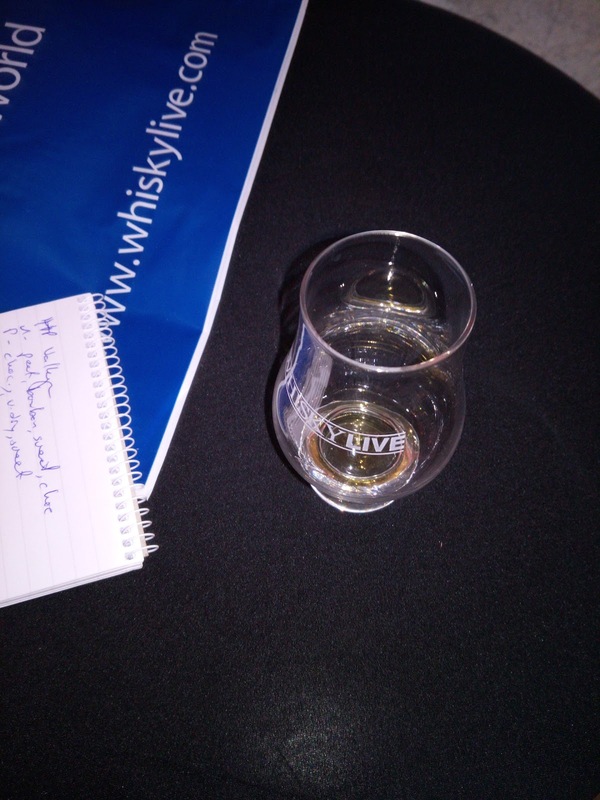 Rubbing the Gecko: WhiskyLive ! Half of the cabal reformed to grace WhiskyLive with our presence. 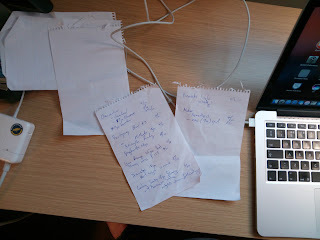 Armed with a notepad, a thirst, and a realisation that we would be back home at a reasonable time, with a good chance of being OK in the morning, we hit London. Stopping first for a coffee, discuss the relative merits of our employers (comedy value only, it appears) we moved onto the great English tradition of queuing to get anywhere. But eh, it was sunny, the crowd was civilised, and we all wanted booze. So, freebies: the usual nice glass (pic below with our first dram), and a 35cl of 12yo HP. Yeah, I'm ok with that. It works really well in Ginger & Whisky cake (recipe here). That cake has been thoroughly tested by me, and my office mates (I told them how much booze was in it, after they'd had it for breakfast). This is their new expression which is due out shortly. Bottled around 46% from memory. I'm not the biggest HP fan, some are great, but there's a number which are a bit too marketing driven for me. But this was very nice and quaffable. The nice chap pouring us booze said it would retail for around £55 - at this point, I'd recommend buying some. F: long. so very long. Look I'm biased. Of course it was the first stand in the main hall we'd go to. I love this whisky. It's light, complex, interesting, the sort you can just lie back and savour while the world goes off and does whatever it wants. Had a lovely chat to their rep, this one is made up of 60% Clynelish [which is very prominent], 20% Dailuaine, and 20% Teanninich. Given I like Clynelish, this was very likely to do well. And the apples / fruit come through beautifully, with that slight hint of waxy salty coastal stuff. 5/10, oddly flavourless. Maybe a victim of other booze? who knows. It appears I liked that one. Kavalan are the Taiwanese whisky makers, there's probably more in Taiwan, but we only hear of these guys. They like their sherry. And they make superb whisky. As a picky bugger, I think they're too perfect, there's not a massive amount of character (not sure that's the word I want, but meh). It's also very pricy. yeah, there's none in my cupboard, how did you guess? Ghosted refers to the old (40yo we were told) cask of Ladyburn which is in this blend. It really was a lovely whisky, but at £370, I'm not rushing out to get a bottle. Although it's worth it. It's a grain whisky from W.Grant's Girvan distillery. I've got nothing against grain whisky, in fact I like drinking them. But at £250, maybe a bit beyond my reach, if I'm spending that on a bottle, I'd like to go for something more traditional. Apparently I was getting very wordy. We broke for a bit of food at this point, because we're nothing if not responsible. This was very similar to the Benriach Solstice, and at around £80 is a steal. A new distillery in Glasgow, they're making a lot of very good gin, while they wait for their whisky to mature. Good range there, and for our money the two whiskies of the day are the (oddly!) HP Valkyrie and the Ledaig 18yo. With the GlenMoray sherry also a contender.